An elegant touch for your special wedding ceremony. Our Elegant Rose collection set will add a special touch to your elegant affair. 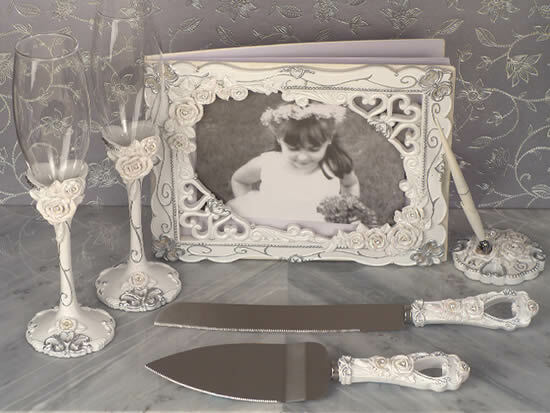 Each set comes with a guest book, pen set, wedding cake and knife server set and toasting glasses set, all matching and enhanced in a white resin finish with Roses design featuring the perfect crystal accents. A wonderful touch for your elegant event. Each piece in this set comes in an individual gift box ready for gift giving.